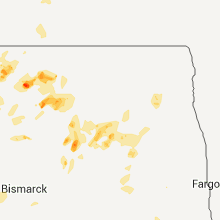 The Lankin, ND area has had 2 reports of on-the-ground hail by trained spotters, and has been under severe weather warnings 21 times during the past 12 months. 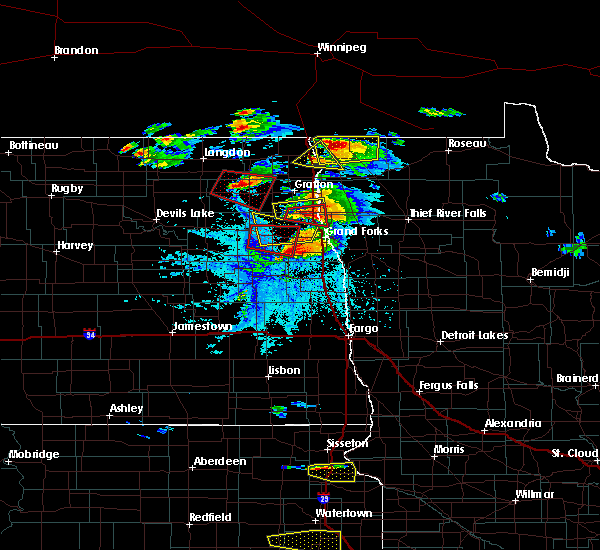 Doppler radar has detected hail at or near Lankin, ND on 16 occasions, including 1 occasion during the past year. 8/26/2018 9:45 PM CDT At 945 pm cdt, severe thunderstorms were located along a line extending from near walhalla to near pekin, moving east at 50 mph (radar indicated). Hazards include 70 mph wind gusts and penny size hail. Expect considerable tree damage. damage is likely to mobile homes, roofs, and outbuildings. these severe storms will be near, walhalla around 950 pm cdt. 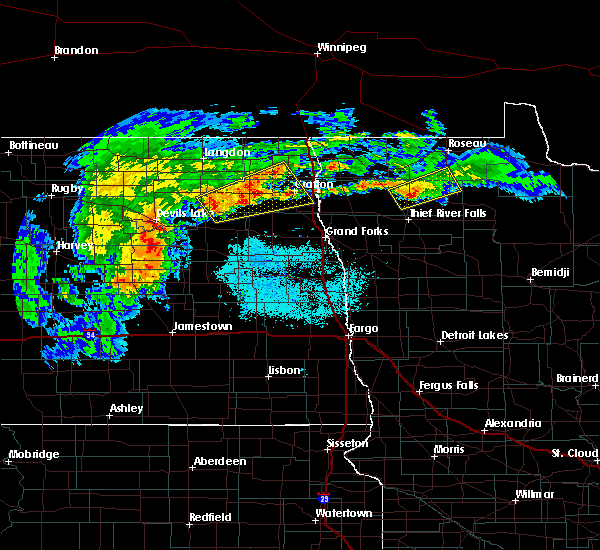 Leroy, kloten and backoo around 1000 pm cdt. 8/26/2018 9:15 PM CDT At 915 pm cdt, severe thunderstorms were located along a line extending from near mount carmel to 8 miles southwest of warwick, moving east at 50 mph (radar indicated). Hazards include 60 mph wind gusts and penny size hail. Expect damage to roofs, siding, and trees. 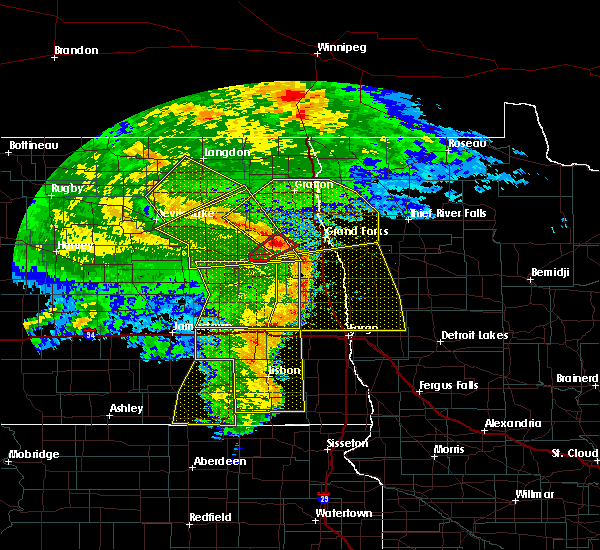 severe thunderstorms will be near, mount carmel and maida around 920 pm cdt. hamar around 930 pm cdt. 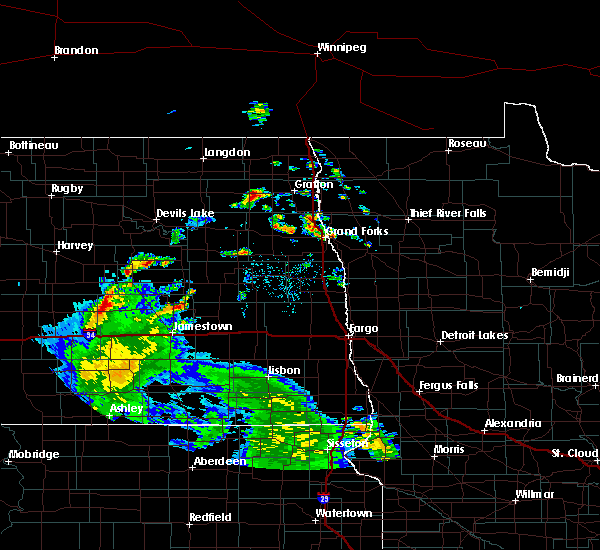 vang around 935 pm cdt. tolna around 940 pm cdt. 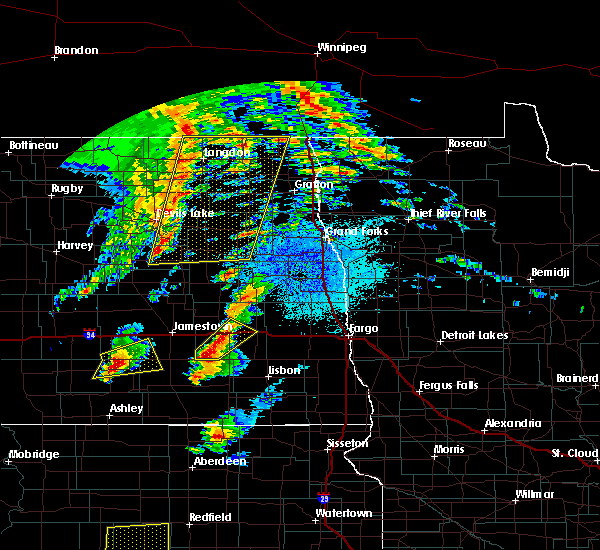 Pekin around 945 pm cdt. 7/4/2018 3:17 AM CDT At 316 am cdt, severe thunderstorms were located along a line extending from near hampden to near whitman, moving northeast at 50 mph (radar indicated). Hazards include 60 mph wind gusts and nickel size hail. Expect damage to roofs, siding, and trees. 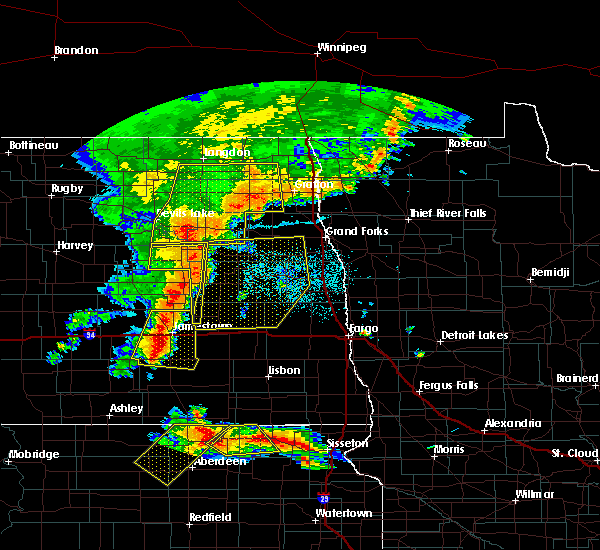 these severe storms will be near, dahlen and whitman around 320 am cdt. 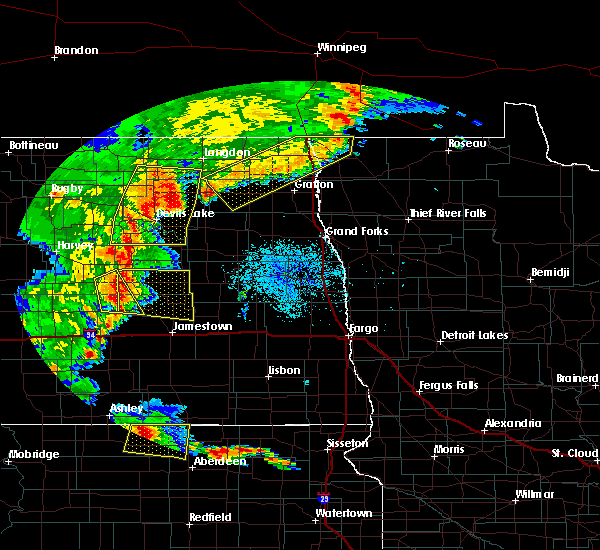 Lankin and fordville around 330 am cdt. 7/4/2018 3:01 AM CDT At 301 am cdt, severe thunderstorms were located along a line extending from near starkweather to near mapes, moving northeast at 50 mph (radar indicated). Hazards include 60 mph wind gusts and nickel size hail. Expect damage to roofs, siding, and trees. 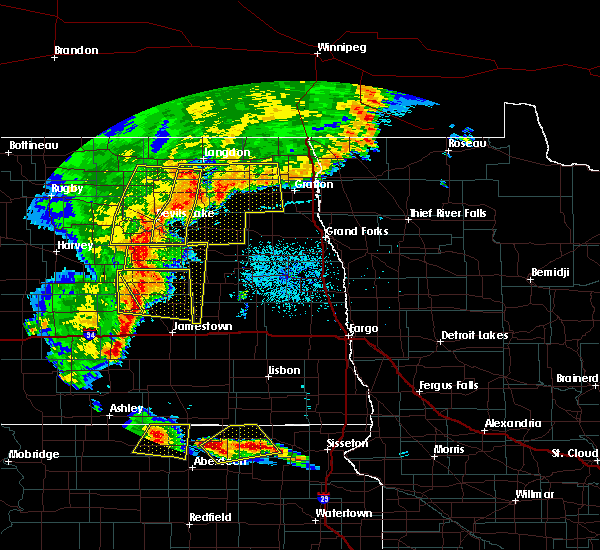 these severe storms will be near, mapes and michigan around 305 am cdt. whitman around 310 am cdt. hampden around 315 am cdt. alsen and dahlen around 320 am cdt. Loma, lankin and fordville around 325 am cdt. 7/4/2018 2:37 AM CDT At 236 am cdt, severe thunderstorms were located along a line extending from near churchs ferry to near hamar, moving northeast at 50 mph (radar indicated). Hazards include 60 mph wind gusts and nickel size hail. Expect damage to roofs, siding, and trees. severe thunderstorms will be near, doyon around 245 am cdt. 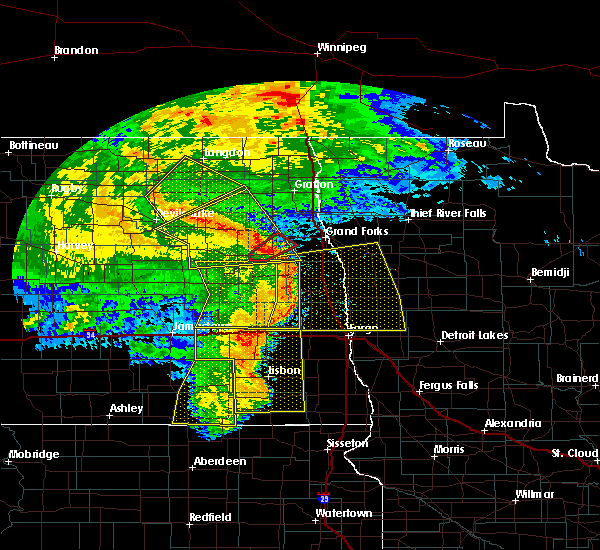 bartlett around 250 am cdt. 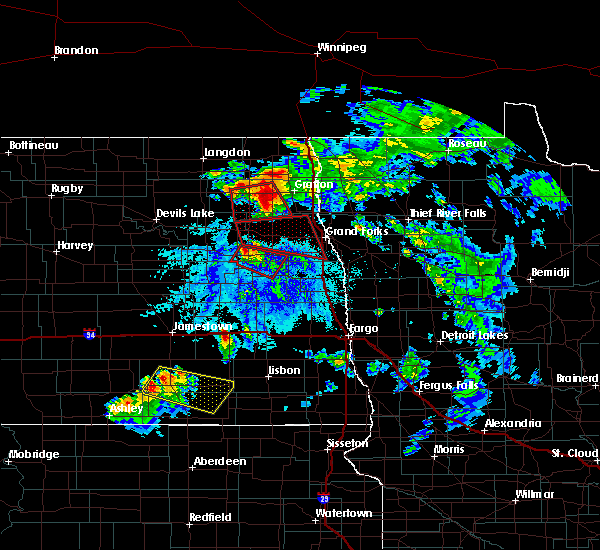 lakota and garske around 255 am cdt. starkweather, mapes and michigan around 300 am cdt. Whitman around 310 am cdt. 6/29/2018 3:54 AM CDT At 354 am cdt, severe thunderstorms were located along a line extending from near whitman to near larimore, moving northeast at 60 mph (radar indicated). Hazards include 60 mph wind gusts and quarter size hail. Hail damage to vehicles is expected. expect wind damage to roofs, siding, and trees. 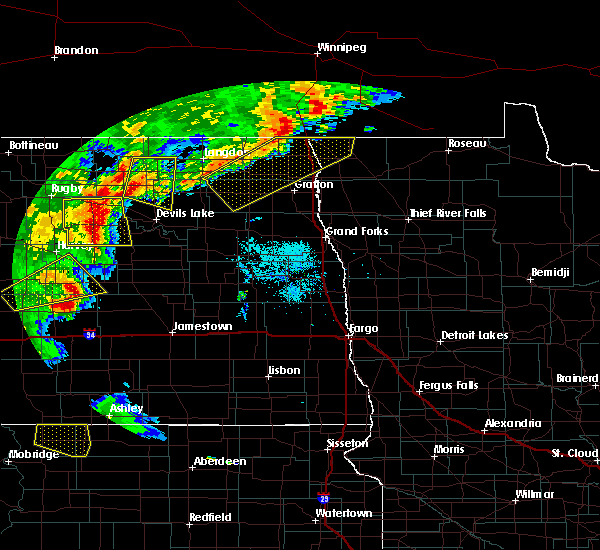 these severe storms will be near, arvilla and turtle river state park around 400 am cdt. Lankin around 405 am cdt. 6/29/2018 3:38 AM CDT At 337 am cdt, severe thunderstorms were located along a line extending from near bartlett to 6 miles north of jessie, moving east at 40 mph (radar indicated). Hazards include 60 mph wind gusts and quarter size hail. Hail damage to vehicles is expected. expect wind damage to roofs, siding, and trees. these severe storms will be near, mapes and kloten around 350 am cdt. 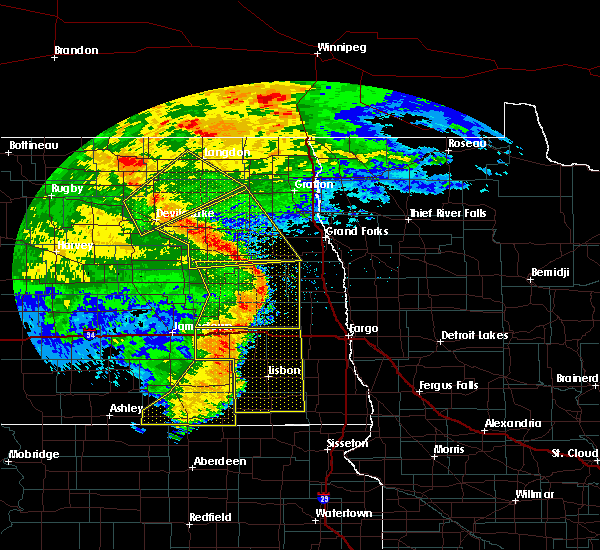 aneta and michigan around 355 am cdt. whitman around 400 am cdt. petersburg around 405 am cdt. 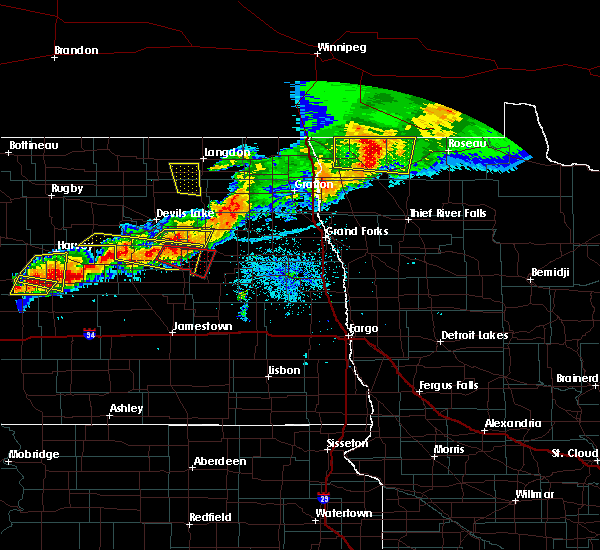 Dahlen, northwood and fordville around 415 am cdt. 6/29/2018 3:15 AM CDT At 314 am cdt, severe thunderstorms were located along a line extending from near crary to near mose, moving east at 40 mph (radar indicated). Hazards include 60 mph wind gusts and quarter size hail. Hail damage to vehicles is expected. expect wind damage to roofs, siding, and trees. 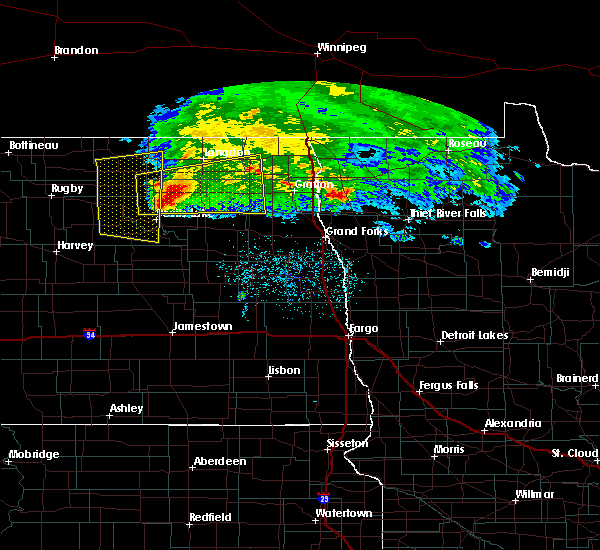 severe thunderstorms will be near, doyon, red willow lake and southam around 325 am cdt. 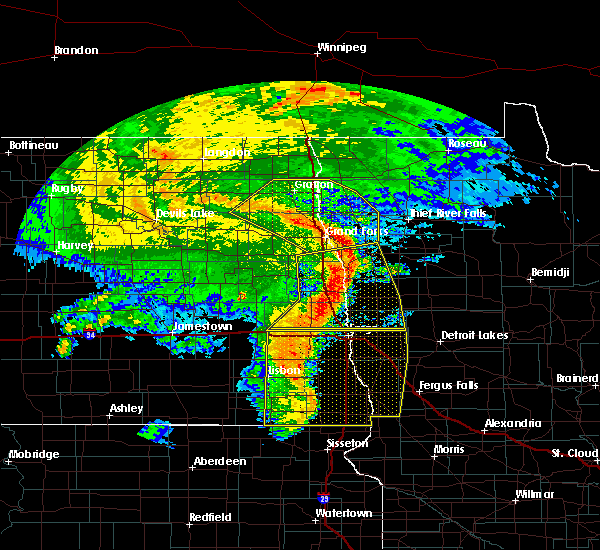 bartlett around 335 am cdt. lakota around 340 am cdt. kloten around 345 am cdt. Aneta and mapes around 350 am cdt. 6/15/2018 12:40 AM CDT At 1240 am cdt, severe thunderstorms were located along a line extending from near icelandic state park to near fairdale to 7 miles northwest of southam, moving east at 35 mph (radar indicated). Hazards include 60 mph wind gusts and quarter size hail. Hail damage to vehicles is expected. expect wind damage to roofs, siding, and trees. 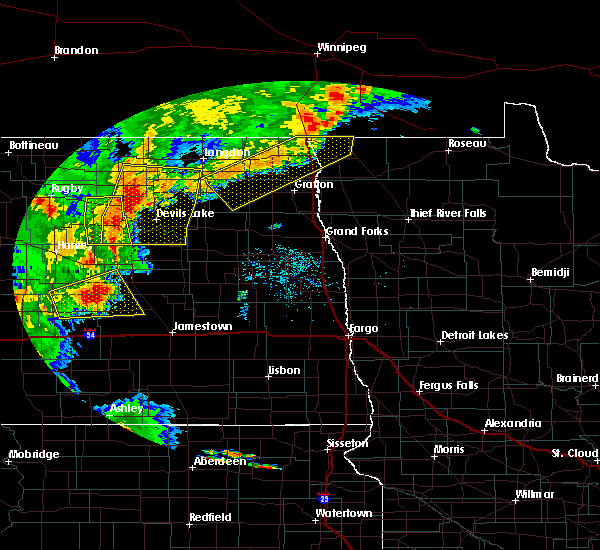 severe thunderstorms will be near, hensel around 1250 am cdt. milton and lawton around 105 am cdt. union around 110 am cdt. edinburg and gardar around 115 am cdt. mountain around 120 am cdt. 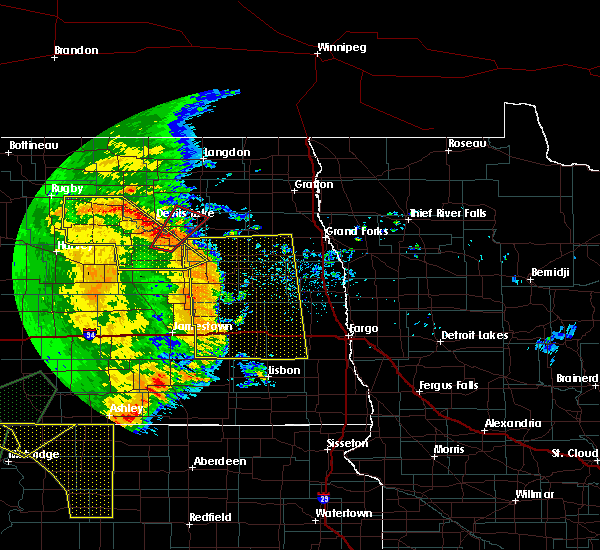 A tornado watch remains in effect until 200 am cdt for northeastern north dakota. 7/11/2017 6:57 PM CDT At 635 pm cdt, a severe thunderstorm capable of producing a tornado was located over adams, or 24 miles southeast of langdon, moving southeast at 25 mph (radar indicated rotation. 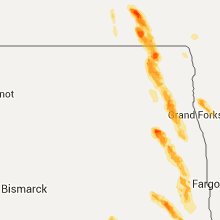 at 635 pm cdt, multiple reports of a tornado was reported between adams and fairdale nd). Hazards include tornado and quarter size hail. Expect damage to mobile homes, roofs, and vehicles. this dangerous storm will be near, adams around 640 pm cdt. edinburg around 655 pm cdt. 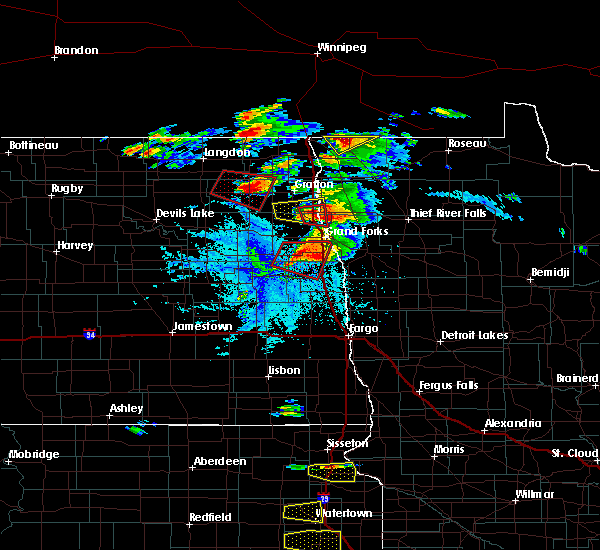 lankin around 705 pm cdt. Park river and pisek around 715 pm cdt. 7/11/2017 6:38 PM CDT At 635 pm cdt, a severe thunderstorm capable of producing a tornado was located over adams, or 24 miles southeast of langdon, moving southeast at 25 mph (radar indicated rotation. 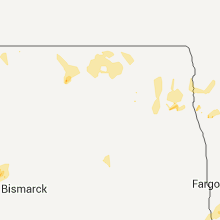 at 635 pm cdt, multiple reports of a tornado was reported between adams and fairdale nd). Hazards include tornado and quarter size hail. Expect damage to mobile homes, roofs, and vehicles. this dangerous storm will be near, adams around 640 pm cdt. edinburg around 655 pm cdt. 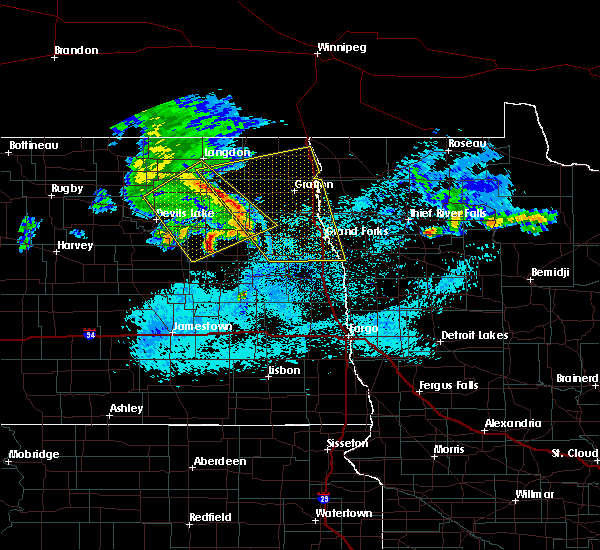 lankin around 705 pm cdt. 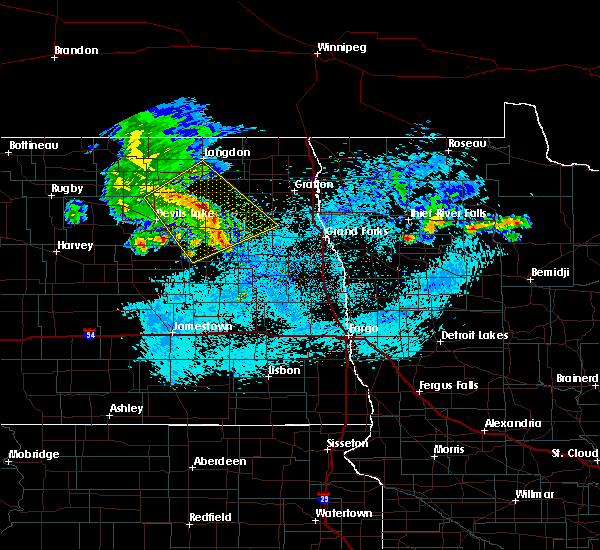 Park river and pisek around 715 pm cdt. 7/11/2017 6:27 PM CDT At 627 pm cdt, a severe thunderstorm capable of producing a tornado was located near fairdale, or 20 miles southeast of langdon, moving east at 30 mph (radar indicated rotation). Hazards include tornado and quarter size hail. Expect damage to mobile homes, roofs, and vehicles. this dangerous storm will be near, adams around 635 pm cdt. union around 640 pm cdt. gardar around 645 pm cdt. edinburg around 650 pm cdt. Park river around 705 pm cdt. 6/10/2017 6:42 AM CDT The severe thunderstorm warning for western marshall, northwestern polk, grand forks, southeastern cavalier, northeastern nelson, walsh and pembina counties will expire at 645 am cdt, the storms which prompted the warning have weakened below severe limits, and no longer poses an immediate threat to life or property. therefore the warning will be allowed to expire. however small hail and gusty winds are still possible with these thunderstorms. 6/10/2017 6:33 AM CDT At 633 am cdt, severe thunderstorms were located along a line extending from near mountain to near northwood, moving northeast at 20 mph (radar indicated). Hazards include 60 mph wind gusts and penny size hail. Expect damage to roofs, siding, and trees. locations impacted include, grand forks, grafton, east grand forks, grand forks afb, park river, larimore and cavalier. This includes interstate 29 between mile markers 132 and 209. 6/10/2017 6:27 AM CDT The severe thunderstorm warning for northwestern grand forks, south central cavalier, northeastern nelson, northeastern ramsey and western walsh counties will expire at 630 am cdt, the storms which prompted the warning have moved out of the area. therefore the warning will be allowed to expire. 6/10/2017 6:19 AM CDT At 618 am cdt, severe thunderstorms were located along a line extending from near milton to near manvel, moving east at 55 mph (radar indicated). Hazards include 60 mph wind gusts and penny size hail. Expect damage to roofs, siding, and trees. Locations impacted include, michigan, fordville, petersburg, adams, lankin, forest river colony and dahlen. 6/10/2017 5:58 AM CDT At 558 am cdt, severe thunderstorms were located along a line extending from hampden to near logan center, moving east at 50 mph (radar indicated). Hazards include 60 mph wind gusts and penny size hail. Expect damage to roofs, siding, and trees. Locations impacted include, lakota, michigan, fordville, petersburg, edmore, tolna and crary. 7/20/2016 9:59 PM CDT At 959 pm cdt, a severe thunderstorm was located over dahlen, or 28 miles southwest of grafton, moving east at 60 mph (radar indicated). Hazards include 70 mph wind gusts and penny size hail. Expect considerable tree damage. damage is likely to mobile homes, roofs, and outbuildings. 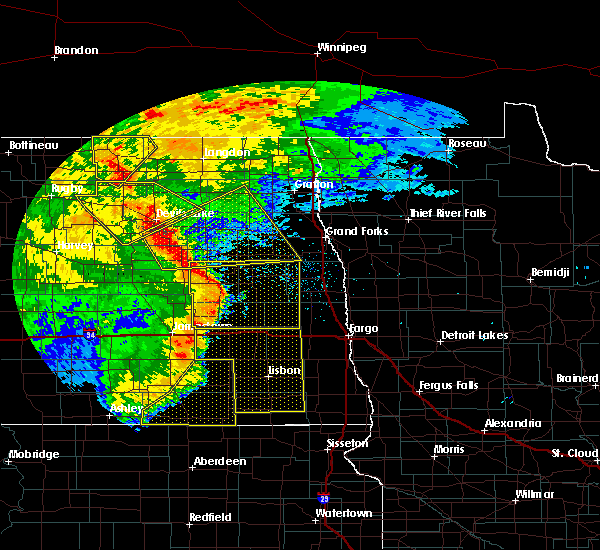 this severe thunderstorm will be near, fordville around 1005 pm cdt. forest river colony, inkster and conway around 1010 pm cdt. forest river, gilby and johnstown around 1020 pm cdt. minto and ardoch around 1025 pm cdt. warsaw and poland around 1030 pm cdt. Also includes interstate 29 between mile markers 150 and 176. 7/9/2016 7:08 PM CDT At 706 pm cdt, severe thunderstorms were located along a line extending from near pisek to near niagara to 7 miles northeast of kloten, moving east at 40 mph (public). Hazards include tennis ball size hail and 60 mph wind gusts. the greatest threat for tennis ball size hail is about 5 miles south of niagra. People and animals outdoors will be injured. expect hail damage to roofs, siding, windows, and vehicles. expect wind damage to roofs, siding, and trees. these severe storms will be near, mccanna, conway and forest river colony around 715 pm cdt. logan center, inkster and veseleyville around 720 pm cdt. 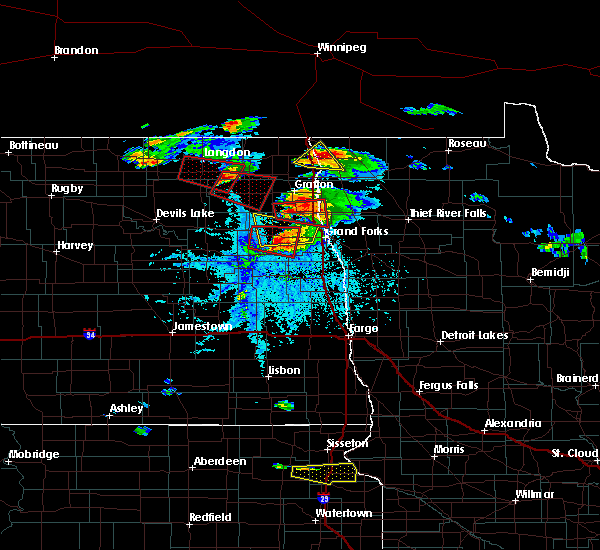 forest river, larimore and voss around 725 pm cdt. arvilla, northwood and emerado around 730 pm cdt. Also includes interstate 29 between mile markers 168 and 171. 7/9/2016 6:49 PM CDT At 648 pm cdt, severe thunderstorms were located along a line extending from near lankin to near michigan to 7 miles northeast of pekin, moving east at 40 mph (public. at 646 pm...golf ball size was reported in michigan). Hazards include golf ball size hail. People and animals outdoors will be injured. expect damage to roofs, siding, windows, and vehicles. these severe storms will be near, petersburg, mcville and lankin around 655 pm cdt. fordville and niagara around 705 pm cdt. pisek around 710 pm cdt. mccanna, conway and forest river colony around 715 pm cdt. logan center, inkster and veseleyville around 720 pm cdt. Also includes interstate 29 between mile markers 166 and 171. 7/9/2016 6:46 PM CDT At 645 pm cdt, severe thunderstorms were located along a line extending from near lankin to near whitman to 6 miles northeast of pekin, moving east at 40 mph (radar indicated). Hazards include quarter size hail. Damage to vehicles is expected. severe thunderstorms will be near, petersburg, mcville and lankin around 655 pm cdt. pisek, fordville and niagara around 705 pm cdt. conway and orr around 710 pm cdt. mccanna, forest river colony and veseleyville around 715 pm cdt. logan center and inkster around 720 pm cdt. Also includes interstate 29 between mile markers 166 and 171. 6/19/2016 4:45 AM CDT At 444 am cdt, a severe thunderstorm was located near fairdale, or 26 miles south of langdon, moving east at 65 mph (radar indicated). Hazards include 60 mph wind gusts and quarter size hail. Hail damage to vehicles is expected. expect wind damage to roofs, siding, and trees. 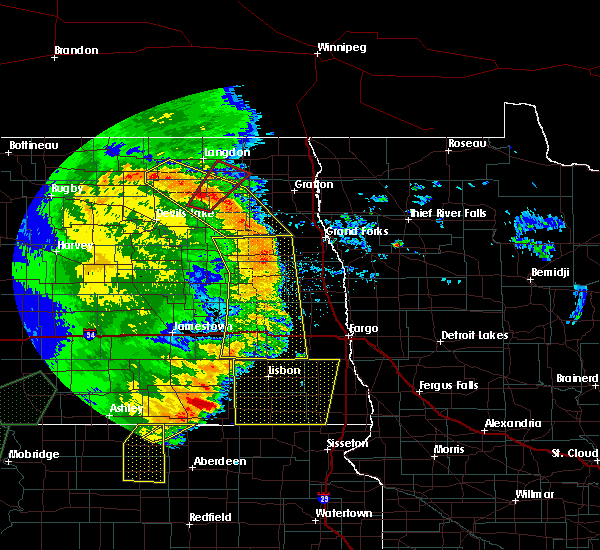 this severe storm will be near, adams around 450 am cdt. lankin around 455 am cdt. 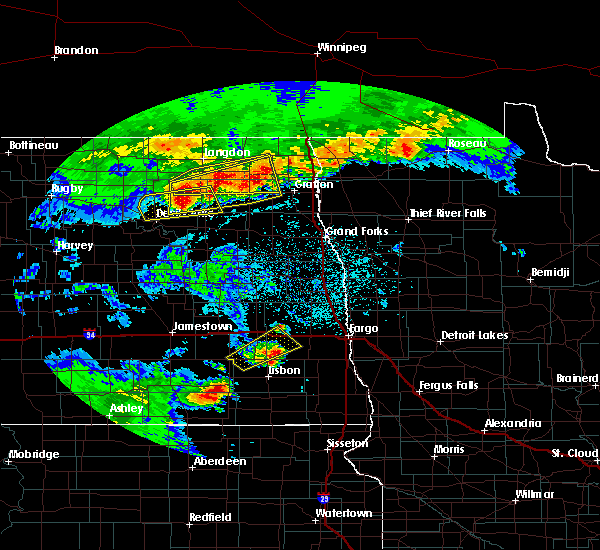 Edinburg and park river around 500 am cdt. 6/19/2016 4:22 AM CDT At 422 am cdt, a severe thunderstorm was located near garske, or 17 miles north of devils lake, moving east at 65 mph (radar indicated). Hazards include 60 mph wind gusts and quarter size hail. Hail damage to vehicles is expected. expect wind damage to roofs, siding, and trees. 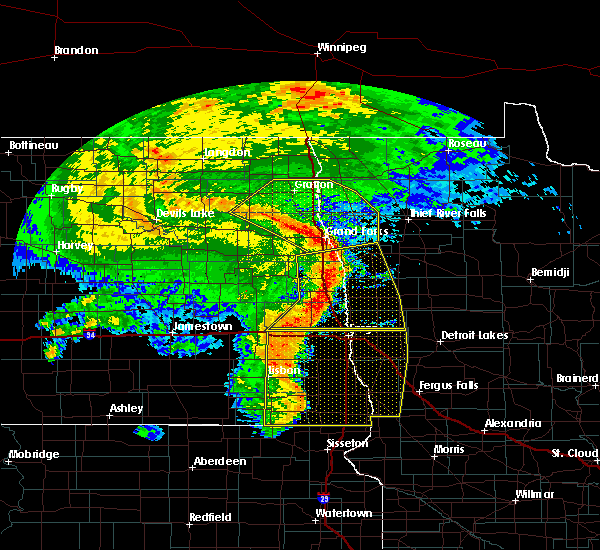 this severe thunderstorm will be near, derrick around 430 am cdt. 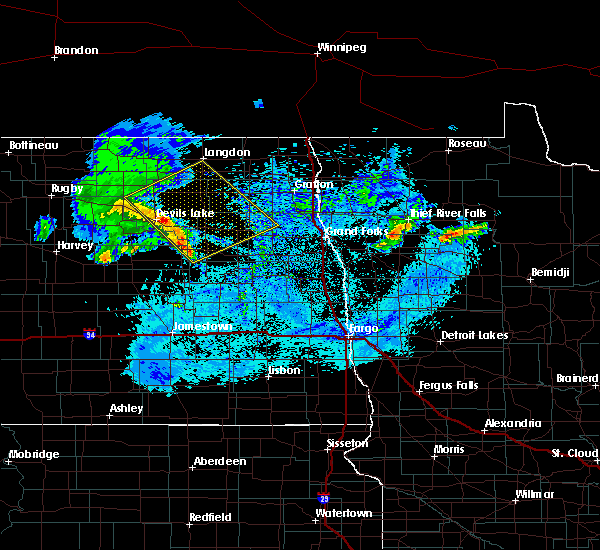 edmore around 435 am cdt. lawton around 440 am cdt. fairdale around 445 am cdt. Adams around 450 am cdt. 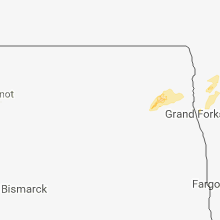 9/4/2015 11:28 AM CDT At 1127 am cdt, a severe thunderstorm was located near park river, or 19 miles west of grafton, moving north at 35 mph (radar indicated). Hazards include quarter size hail. Damage to vehicles is expected. this severe thunderstorm will be near, edinburg around 1140 am cdt. union around 1145 am cdt. crystal and gardar around 1150 am cdt. mountain and hensel around 1200 pm cdt. Concrete around 1205 pm cdt. 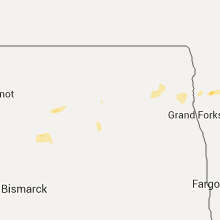 7/23/2015 10:45 PM CDT At 1045 pm cdt, severe thunderstorms were located along a line extending from mountain to near park river to near brocket to near hamar, moving east at 45 mph (radar indicated). Hazards include 60 mph wind gusts and nickel size hail. Expect damage to roofs. siding and trees. 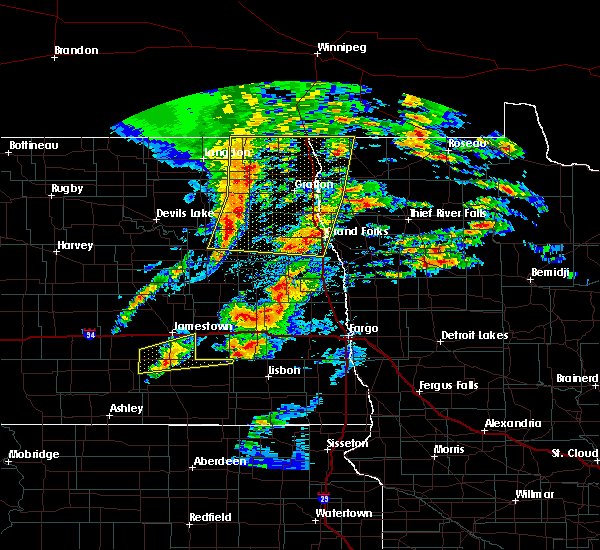 these severe storms will be near, pisek and park river around 1050 pm cdt. 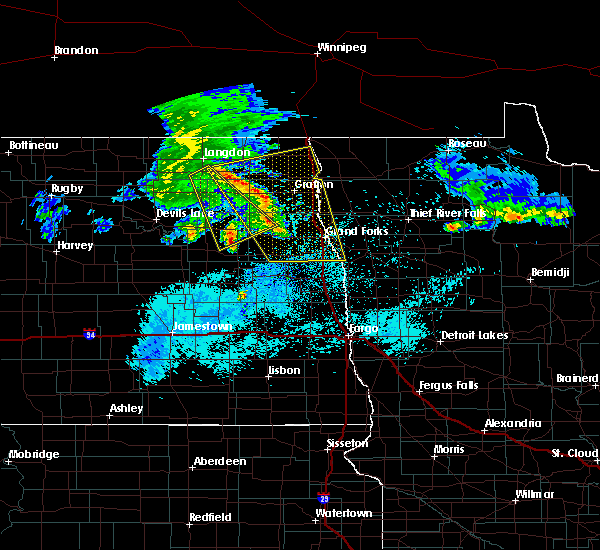 crystal, veseleyville and mandt around 1100 pm cdt. 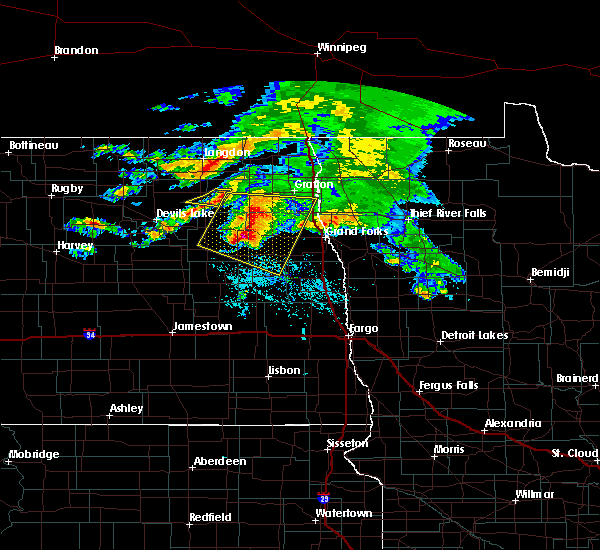 dahlen around 1110 pm cdt. 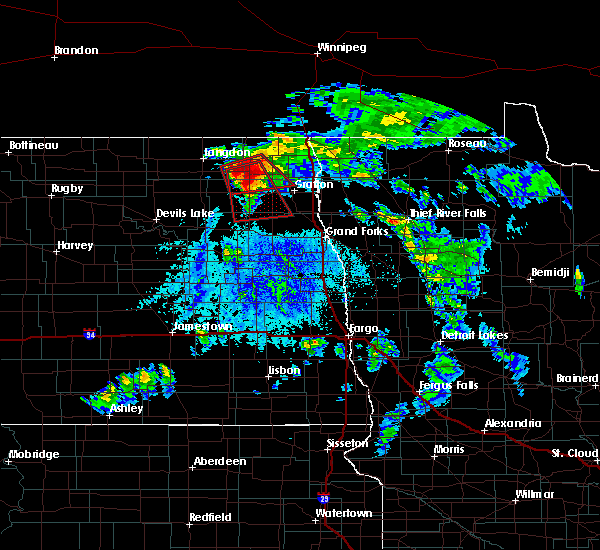 Fordville and conway around 1115 pm cdt. 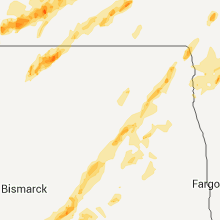 7/23/2015 10:09 PM CDT At 1008 pm cdt, severe thunderstorms were located along a line extending from near loma to lawton to near devils lake to near warwick, moving east at 30 mph (radar indicated). Hazards include 60 mph wind gusts and nickel size hail. Expect damage to roofs. siding and trees. severe thunderstorms will be near, edmore, lawton and loma around 1010 pm cdt. nekoma around 1015 pm cdt. southam around 1025 pm cdt. 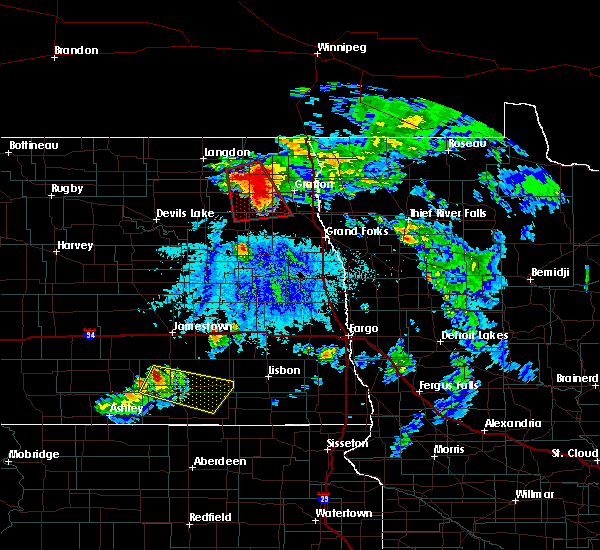 hamar, hove mobile park and doyon around 1030 pm cdt. Adams around 1035 pm cdt. 7/23/2015 9:51 PM CDT The severe thunderstorm warning for northwestern kittson, southeastern cavalier, pembina and western walsh counties will expire at 1000 pm cdt, the storms which prompted the warning have weakened below severe limits, and no longer pose an immediate threat to life or property. therefore the warning will be allowed to expire. a severe thunderstorm watch remains in effect until 100 am cdt for northwestern minnesota and northeastern north dakota. 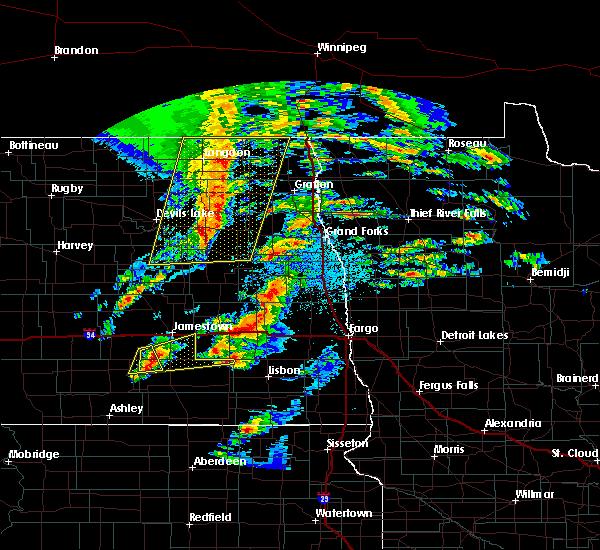 7/23/2015 9:29 PM CDT At 927 pm cdt, severe thunderstorms were located along a line extending from near humboldt to near joliette to fairdale, moving east at 40 mph (radar indicated). Hazards include 60 mph wind gusts and penny size hail. Expect damage to roofs. siding and trees. 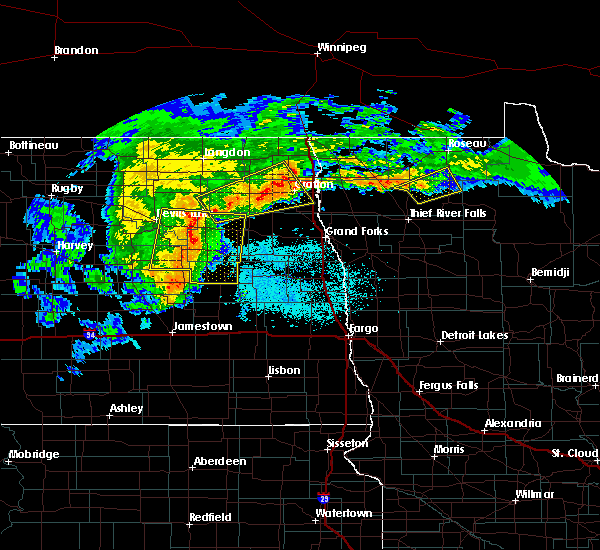 these severe storms will be near, pembina, humboldt, joliette, noyes and st. vincent around 930 pm cdt. northcote and orleans around 940 pm cdt. hallock and union around 945 pm cdt. edinburg and lancaster around 950 pm cdt. park river around 1000 pm cdt. also includes interstate 29 between mile markers 191 and 217. This line of storms produced a 64 mph wind gust in cavalier. 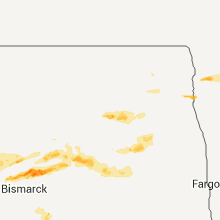 7/23/2015 9:07 PM CDT At 906 pm cdt, severe thunderstorms were located along a line extending from near neche to near nekoma, moving southeast at 20 mph (radar indicated). Hazards include 60 mph wind gusts and penny size hail. Expect damage to roofs. siding and trees. 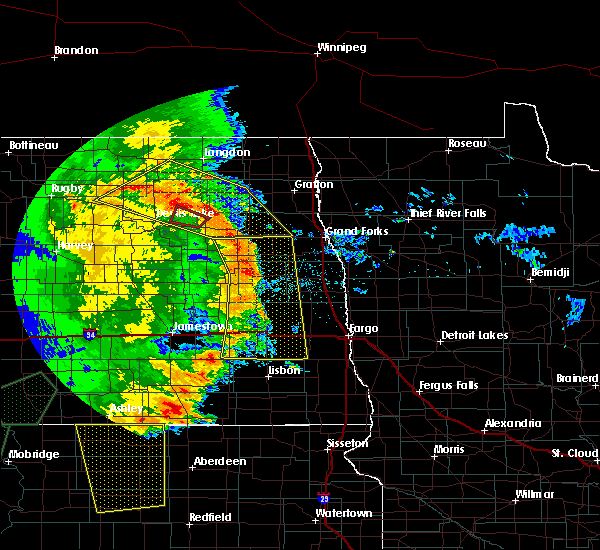 severe thunderstorms will be near, neche around 910 pm cdt. bathgate around 920 pm cdt. 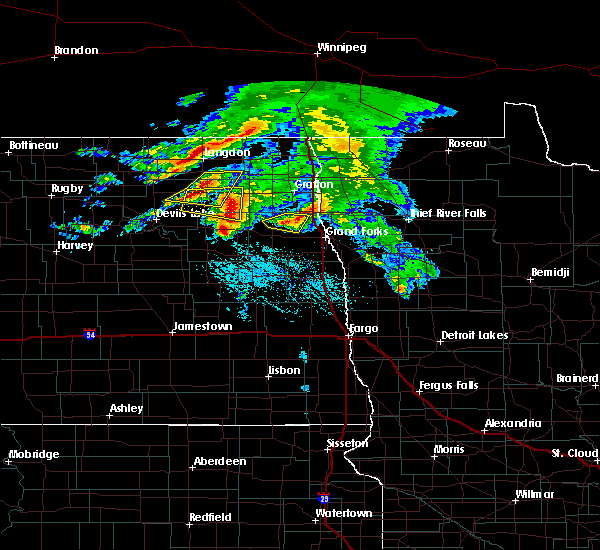 pembina and st. vincent around 935 pm cdt. 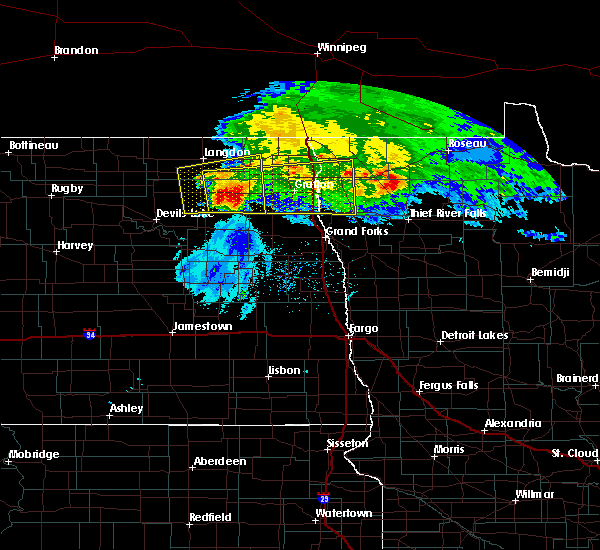 adams and joliette around 1000 pm cdt. Also includes interstate 29 between mile markers 191 and 217. 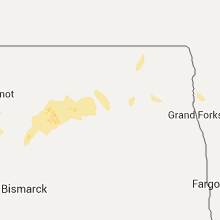 7/5/2015 10:31 AM CDT At 1029 am cdt, a severe thunderstorm was located near park river, or 14 miles west of grafton, moving east at 55 mph (radar indicated). Hazards include 60 mph wind gusts and quarter size hail. Hail damage to vehicles is expected. expect wind damage to roofs, siding and trees. 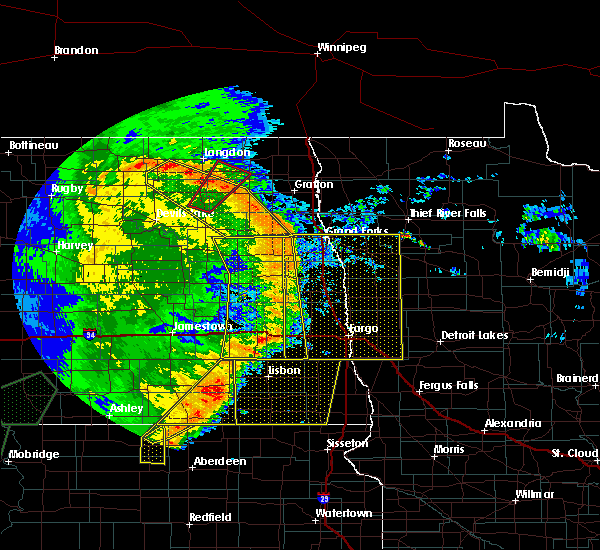 this severe storm will be near, mandt and veseleyville around 1035 am cdt. nash around 1040 am cdt. grafton and auburn around 1045 am cdt. Oakwood around 1050 am cdt. 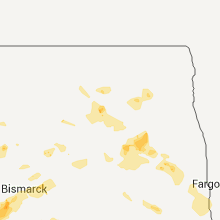 7/5/2015 10:02 AM CDT At 1001 am cdt, a severe thunderstorm was located near brocket, or 30 miles east of devils lake, moving northeast at 30 mph (radar indicated). Hazards include 60 mph wind gusts and quarter size hail. Hail damage to vehicles is expected. expect wind damage to roofs, siding and trees. this severe thunderstorm will be near, whitman around 1010 am cdt. lankin around 1035 am cdt. fordville around 1040 am cdt. pisek around 1050 am cdt. Park river around 1055 am cdt. 6/27/2015 4:46 PM CDT At 445 pm cdt, a confirmed tornado was located over conway, or 19 miles southwest of grafton, moving southeast at 40 mph (weather spotters confirmed tornado). Hazards include damaging tornado and golf ball size hail. Flying debris will be dangerous to those caught without shelter. mobile homes will be damaged or destroyed. damage to roofs, windows and vehicles will occur. tree damage is likely. this tornado will be near, forest river colony around 450 pm cdt. Inkster around 455 pm cdt. 6/27/2015 4:31 PM CDT At 429 pm cdt, a confirmed tornado was located near lankin, or 20 miles west of grafton, moving south at 35 mph (weather spotters confirmed tornado). Hazards include damaging tornado and golf ball size hail. Flying debris will be dangerous to those caught without shelter. mobile homes will be damaged or destroyed. damage to roofs, windows and vehicles will occur. tree damage is likely. this tornado will be near, fordville around 435 pm cdt. forest river colony and conway around 440 pm cdt. Inkster around 445 pm cdt. 6/27/2015 4:12 PM CDT At 411 pm cdt, a confirmed tornado was located over union, or 24 miles west of grafton, moving southeast at 50 mph (weather spotters confirmed tornado). Hazards include damaging tornado and golf ball size hail. Flying debris will be dangerous to those caught without shelter. mobile homes will be damaged or destroyed. damage to roofs, windows and vehicles will occur. tree damage is likely. the tornado will be near, edinburg around 415 pm cdt. park river around 425 pm cdt. lankin around 430 pm cdt. pisek and veseleyville around 435 pm cdt. Fordville and conway around 440 pm cdt. 1/1/0001 12:00 AM Quarter sized hail reported 1.9 miles NNW of Lankin, ND, hail in various sizes from one quarter to one inch in diameter.